October 4, 2018 at the Ebbett’s Pass Fire District, 1037 Blagen Road, Arnold, CA. 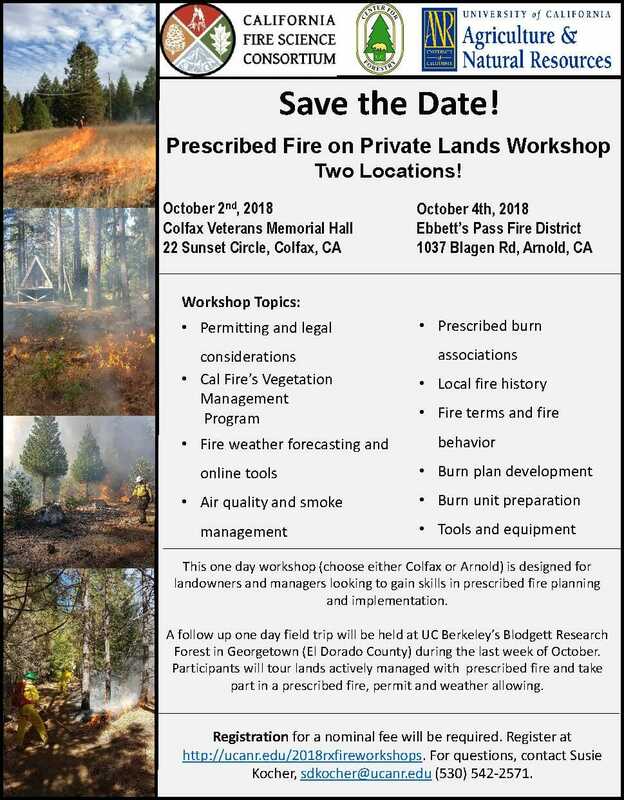 Each workshop will feature similar content including presentations on prescribed fire, including local fire history and current fire research, prescribed fire permitting and legal considerations, fire weather forecasting and online tools, air quality and smoke management, fire terms and fire behavior, burn plan development, burn unit preparation and fire tools and equipment, as well as models for accomplishing prescribed fire on private lands, including prescribed burn associations and Cal Fire’s Vegetation Management Program. 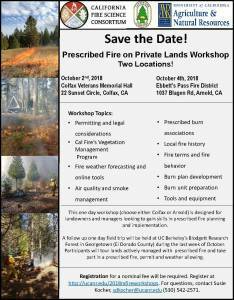 Participants in each workshop will be invited to participate in a field trip to look at lands actively managed with prescribed fire and to participate in a live training burn (weather permitting) during the last week of October at the University of California Berkeley’s Blodgett Research Forest near Georgetown in El Dorado County. Registration by September 27th is required to participate. Please go to http://ucanr.edu/2018rxfireworkshops to register. The cost of $25 will cover lunch and materials. After registering, you will be provided with further instructions on the workshop and the agenda of presentations. For more information contact Susie Kocher at 530-542-2571 or sdkocher@ucanr.edu. Go if you want to find out the real data on burning your property. I went earlier this year. Very interesting. A lot of info for pasture land owners too.